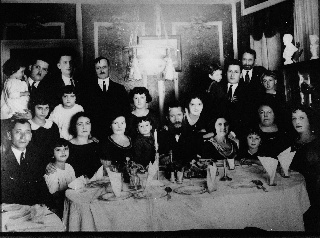 Garber family about November 1922. This was taken on the Lower East Side of NYC shortly after the arrival of the Avrum Garber (the formidable looking gentleman in the center). This database includes surnames associated with Yurovshchina/Labun either through birth or residence. It is a work in progress and reflects a compilation of information from various sources. Generally, a name has not been included unless it has been confirmed by a second source. Immigration sources: Ellis Island database; Hamburg manifest database. Cemetery: Montefiore Cemetery record name plus additional source confirmation that shows surname from shtetl. Other shtetls: Gleaned from immigation and naturalization records when there is a difference in last residence and birthplace; locations of close relations (with family name) left behind in Europe; personal communications from relatives; other records. Emigrated to: Reflects relocation of first generation emigrants with that name (or maiden name).